First in an occasional series on Magarac, Kevin Sousa’s new restaurant in Braddock, Pa. Even more people are going to think chef Kevin Sousa is nuts: He’s not only opening his next restaurant in busted-down Braddock, he’s also moving his family there. At a press conference June 19 at County Executive Rich Fitzgerald’s office, the multi-tasking co-owner of Salt of the Earth in Garfield — and Station Street Hot Dogs and Union Pig and Chicken in East Liberty — announced that he’s opening a restaurant in the former Cuda’s Italian Market building at Eighth Street and Braddock Avenue, a desolate corner in one of the region’s most desolate business districts. 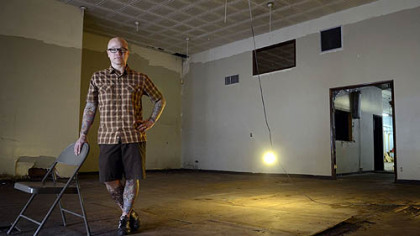 As a sign of his commitment to this broke but the once-bustling borough on the Monongahela River, Mr. Sousa decided he’s going to live there, too, in the old Ohringer Building just down the street. 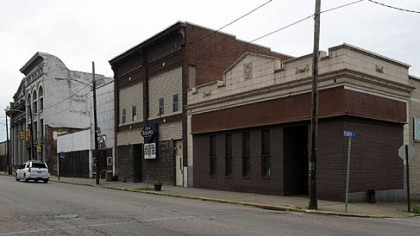 Plans are still in the initial stages for the loft Massaro Corp. will construct for his wife and daughters in the former commercial space, built as a furniture store in 1929 and used for years as office space for Allegheny County’s Human Services Department. It will be called Magarac. The name — Croatian for donkey — honors the imaginary Croatian steel worker who is the Paul Bunyan of steelmaking, and is embodied in a statue at the hulking Edgar Thomson Steel Works in North Braddock. It will feature the works of local artists such as Iron Eden’s John Walter, who is crafting a 23-foot steel and iron tree to be its focal point. The dishware will be made across the street by potters in the library’s basement pottery studio. “From the minute I walked around town, it just felt right,” said Mr. Sousa. Financing for the $714,000 project, which will begin construction this fall, includes a $290,000 Community Development Block Grant received by Heritage five years ago through Dan Onorato’s county administration, along with a another grant and money raised by the community. In addition, Mr. Fitzgerald’s office has secured a $50,000 grant to renovate building’s brick and stone facade. But when the hospital shut down, those plans no longer made sense, Heritage president and chief executive officer Michele Atkins said. When the building started to collapse, the county “graciously” transferred the funds to the Cuda building, which Heritage bought in 2007 for $2,150 with plans to turn it into housing. Mr. Fetterman, though, isn’t the type to give up. Many would be scared off by Braddock’s landscape, a town where 90 percent of its original buildings are in the landfill and the remnants are in desperate need of repair. Because Heritage has worked out a deal in which he’ll pay no rent for the first two years, Mr. Sousa said he’ll be able to afford taking a few more risks than at Salt with his modern American cuisine. Already, he’s thinking about the things he’ll be able to do — including lots of exotic preserving — with the fresh organic produce he’ll get at Braddock Farms and also grow on the lot across the street. While he’s counting on foodies to come from all over, he’ll also serve the local community, with lower-priced, more accessible foods. The process of opening a restaurant never is easy, Mr. Sousa said, but working in this project’s favor is the fact all of the players have a common goal: Bringing people back to this once-thriving steel town. Endurance athlete Scott Jurek has run, and won, some of the world’s longest and most physically demanding races, including the Badwater 135-mile ultramarathon through Death Valley, where the temperature can slide past 120 degrees even in the shade; the Spartathlon, a 153-mile foot race that traces Greek messenger Pheidippides’ historic run in 490 B.C. from Athens to Sparta; and California’s rugged 100-mile Western States Endurance Run, which he won a record seven times in a row. 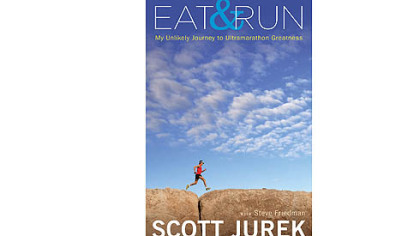 Yet as he concludes in his winning new memoir, “Eat & Run: My Unlikely Journey to Ultramarathon Greatness,” what matters more than victory is what you do to reach it, and how. Page 1 finds the Minnesota-born athlete 70 miles into his first Badwater, vomiting his guts out on the side of the road, certain he can’t take another single step let alone keep running 65 miles in the soul-sucking heat. But “quit” is not in this 38-year-old runner’s vocabulary. He not only powers through the pain, but does so in record time, winning the race in 24 hours and 36 minutes. Even more amazing, and the focus of much of the book, is that he did it on a vegan diet. Mr. Jurek’s deep connection with food started early, albeit in a different direction. Midwesterners are known for their love of hunting and fishing, and he learned both at a young age, along with what to do with the spoils. His mother developed multiple sclerosis when he was in elementary school, requiring him to take on many of the household chores, including cooking. His disciplinarian father, who had to work two jobs to make ends meet, wasn’t the type to listen to complaints. “Sometimes you just do things” became his mantra. It wasn’t until high school, we learn, that he started running, not so much as an escape but as a way to build up his endurance for the high school cross-country ski team. In college, he discovered he had a talent for chugging monster distances of up to four hours. In 1994, he ran his first ultra with his friend and training partner Dusty Olson, the Minnesota Voyageur 50, and finished second. And a side career to his job as a physical therapist was born. Books about nutrition can be boring, but Mr. Jurek is a talented storyteller, weaving his discovery of the vegan lifestyle into an inspiring tale of how a skinny, poor kid who had everything stacked against him — including a mother who couldn’t walk for most of his life — learned not just to adapt, but to draw strength from life’s difficulties. With his breezy prose, Mr. Jurek — a sought-after motivational speaker — at times can seem somewhat simplistic as a natural-born athlete with an almost freakish ability. But that’s also what makes the book such a fascinating (and fun) read. He also appears to be a pretty good plant-based cook, which is encouraging for those trying to eat more vegetables and whole grains. He gave up meat in 1997 and became vegan two years later. Still, there’s plenty of dish for people who want to know more about the sport of ultramarathoning. Each of the 22 chapters ends with a favorite plant-based recipe, and peppered throughout are nutritional tidbits and studies. The book also includes practical training and technique tips, the biggest of which is this: You can be serious about your running, and have to be if you want to succeed, but don’t take yourself too seriously. Toss all ingredients to combine and let sit for 10 to 20 minutes or more before serving. 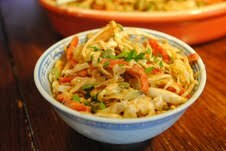 Makes 6 to 8 side-dish servings. This easy vegan dish is one of ultramarathoner Scott Jurek’s favorite dishes. Combine all ingredients in a small mixing bowl or blender. Mix well until smooth. Keeps refrigerated for 2 weeks or frozen for several months. This a third in a series of stories and videos on local traditions by Gretchen McKay and videographer and photographer Steve Mellon. As in so many Italian homes, something wonderful was always cooking in Mary Battaglia’s kitchen when she was a child growing up in Koppel, Beaver County. But nothing made the family clap their hands in delight quite like her mother’s Easter bread. 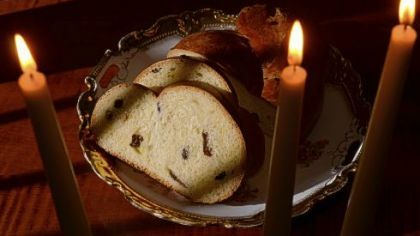 Kneaded into a soft, elastic dough and then left to rise in a warm corner of the kitchen a few days before the most holy day of Easter, the bread was probably the most delectable — and anticipated — food to come out of the oven: slightly sweet, flavored with lemon and studded with plump raisins. It was especially delicious toasted and buttered. Naturally, Mrs. Battaglia brought the recipe with her when she started married life in 1942 with husband, Joe, a Johnstown native whom she met when she was 19. It probably would have stayed in the family had their priest not urged Mr. Battaglia to come up with a fund raiser for the mens’ group that he’d founded in the early 1970s at Queen of Heaven Roman Catholic Church on Sixth Avenue in Koppel, just around the corner from the tidy two-story house where they raised six children. “So I came home and tried to think of something else” as a project for The Holy Name Society, he recalled. It was Mary who suggested selling those heavenly loaves of Easter bread, then taught the men how to make it just as her mother had taught her. That inaugural bread-making session in 1973 netted 35 loaves, sold for 4 bucks apiece. The fundraiser has since become one of Koppel’s best-known Easter traditions — and a pretty big one at that. This year’s crew of volunteers cranked out nearly 2,000 loaves over the course of the four-day baking period which started at 5 a.m. last Tuesday. The last of the loaves, now $8, were sold Sunday. But, a year ago, the bread-baking tradition that uses a ton of flour, 300 dozen eggs and 400 pounds of sugar appeared over. Less than three weeks before Easter, a fire raged through the church’s office and sacristy. No one was hurt, but the building was so badly damaged that the Catholic Diocese of Pittsburgh closed it. “It was terrible, absolutely heartbreaking,” recalled Mrs. Battaglia, who heard the fire whistles blowing at around 2:30 p.m. April 1, 2011, but never imagined the fire trucks were rushing to the church where all of her children were baptized. After the flames were extinguished, the realization hit that four stained glass windows and a pipe organ weren’t the only things to go up in a cloud of smoke. The ingredients needed for the bread, mostly donated, also were ruined, and with them, any hope of continuing a long-standing religious tradition. To understand how devastated people felt, you have to realize how important Easter is in Western Pennsylvania. Part of what makes the region so special is the large number of the ethnic groups who’ve settled here, and the cultural and religious traditions they brought with them. 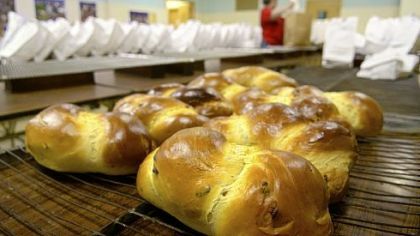 For many — Polish, Russian, Greek, Italian — the holiday wouldn’t be complete without a golden braided loaf of bread on the table..
“Easter bread is symbolic of the rebirth of Jesus Christ,” said the pastor, the Rev. Mark Thomas, who at the time of the fire was splitting his time between Queen of Heaven with Holy Redeemer Roman Catholic in nearby Ellwood City. For the men of Holy Name, the loss of the annual fundraiser would cost them thousands of dollars it earned for parish projects. They also feared losing the fellowship and camaraderie the breadmaking inspired, and the way it brought their tiny community together. The logical solution was to move the operation to Holy Redeemer, where the much-smaller Koppel parish already had been holding some of its events. The only problem was that the women there were busy with their own nut roll, pierogie, pepperoni puff and meatball fundraisers. Plus, its parochial school kitchen, which feeds 100 a day, wasn’t set up for bread-making. “It was a logistical nightmare,” remembers David Kosior, a construction worker and part-time church organist who’s been the head baker for 14 years. Rather than one compact area in which to mix, roll, bake and then cool the sweet bread, plus a dedicated proofing room in which to let it rise, they’d have to set spread out operations across several areas in the gym. Even if they could somehow manage the change, how could they overcome feeling like interlopers in their new surroundings? The answer lay with Father Thomas, who not for one minute thought the two parishes wouldn’t come together. “There’s always new possibilities to keep faith alive,” he said. Everyone stepped gingerly at first, as neither group of volunteers wanted to get in the other’s way. But Holy Redeemer’s welcome was so warm that the bread-makers never missed a beat. 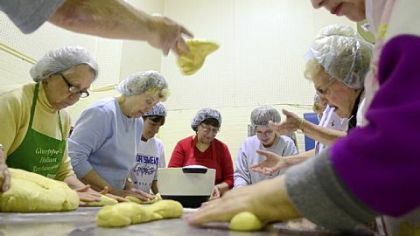 A few long-time Holy Redeemer parishioners volunteered to make bread with the men. There were challenges. Mr. Kosior had to get used to new ovens, and the carpeted music room where they proofed the dough using portable heaters ended up being a bit too damp. (It’s been much more successful this year in an old shower room.) But it was nothing they couldn’t handle. It’s been much smoother sailing this year, though they’re still perfecting the system. With six ovens, they can bake 51 loaves at a time, or more than 400 a day. Even so, the church, which officially merged with Holy Redeemer in November, still sold out. No longer able to drive the 3 miles to Ellwood City and admittedly moving a bit slower, the Battaglias aren’t actively involved in the fundraiser that’s become their legacy. “We got lazy,” Mr. Battaglia joked. But his wife still bakes bread and rolls whenever she can. She hopes her 11 grandchildren and 15 great-grandchildren will continue the tradition. This is a bread that comes from somewhere else. This recipe from Mary Battaglia makes about a dozen loaves, enough to start your own fundraiser. Stir together 1 tablespoon sugar and dry yeast into 1 cup of warm water. Let sit until it foams well. Mix all dry ingredients together in a large pan or bowl. Make a well in the middle. Beat eggs in a separate large bowl, then add oil, remaining 3 cups water and lemon flavoring, zest and juice. Pour mixture into well. Add proofed yeast mixture. Mix and knead till smooth, adding flour as needed. Dough should be just past sticky, not too stiff. Stir in raisins, if using. Place in a greased pan and grease top of dough. Cover. Set in a warm place (between 72 and 80 degrees) and let rise till it doubles in size. Punch down and allow to rise again. Cut into 1-pound sections. Roll each section into a 14-inch rope. Braid with 2 ropes to form a loaf, tucking ends under. Repeat with remaining ropes. Place loaves on greased cookie sheets. Cover, and let rise again, about 45 minutes. Brush exposed loaf with beaten whole egg. Bake at 250 degrees for 30 minutes. Raise temperature to 300 degrees and bake an additional 15 minutes. Bottom of loaf should be light brown and sound hollow when tapped. Makes 10 to 12 loaves. This is the fourth “This Is Pittsburgh Food,” a series of stories and videos on local traditions by Gretchen McKay and videographer and photographer Steve Mellon. Louis Greenwald was just 23 when, against his father’s advice, he bought Bell’s Market, a small butcher shop and grocery on Braddock’s main drag. His father, Edward, had owned a meat business on Fifth Avenue in McKeesport when he was growing up, as had his paternal grandfather, J.B. Greenwald. Same with his grandfather on his mother’s side, who was a butcher in Jeanette. At the time in 1967, this mill town along the Monongahela River bustled with dozens of mom-and-pop shops lining Braddock Avenue leading to the Edgar Thomson Steel Works, the hulking steel mill constructed by Andrew Carnegie in 1873, and for many years one of the town’s main employers. Who could blame a young entrepreneur for wanting to be part of the action? Forty-plus years later, the tiny shop at the corner of Braddock and Sixth, is still is open for business, one of a handful of independent retailers still standing in a town that just a few years ago was almost given up for dead. Its stubborn existence is a sign not just of Mr. Greenwald’s work ethic and driving personality — 11-hour days are still the norm for his staff of six — but also a testament to his commitment to the struggling community. Times have been tough all over the Mon Valley, but especially so in Braddock, which during its heyday in the ’30s squeezed more than 20,000 people into its 0.6 square miles. Today, thanks to suburbanization and de-industrialization, it counts about 2,100 residents. A third of them live in poverty. A smart businessman would have gotten out. Not Mr. Greenwald. 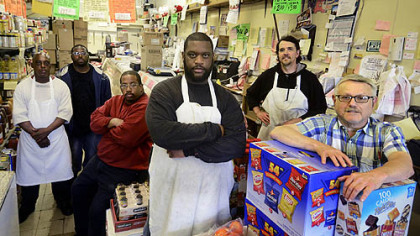 In addition to providing the town’s sole full-service grocery, the 69-year-old runs a thriving wholesale meat business out of the one-story building, which has played an integral role in feeding Braddock’s residents since it was a dirt-floored store selling pickled and salted meat in the 1890s. It’s the same tradition of looking out for others that helped Mr. Greenwald when he was getting started. When Carl Osterholm, who owned Carl’s Tavern next door, discovered on a hot July day that his new neighbor didn’t have air conditioning, he not only sent his refrigeration guy over with a used A/C unit but also hooked it into his water tower. For free. Even better, Mr. Greenwald recalls, he gave him business — providing meat for his seven restaurants. 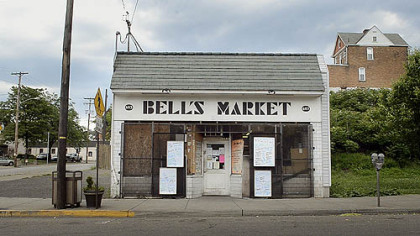 To step into Bell’s is to step back in time: Crammed floor to tin ceiling with everything from cereal to frozen fish to spices to gallon-sized jugs of barbecue sauce, the store is so packed you almost have to crab walk to get to the meat cases. Shoppers have their choice of everything from steak, pork and chicken to salami and headcheese. For prices, look to the hand-lettered signs taped, along with hundreds of invoices, to the wall. Bell’s has a few specialty items, too, that appeal to its growing number of Jamaican and African customers, such as the goat meat butcher Dave Kennedy is carving into kebab-sized chunks on a recent Tuesday. A small selection of fresh fruits and vegetables sit in boxes at the front of the store, next to a dairy cooler. You “can get a little of everything,” agrees Walt Andrews, who started working at the store 20 years ago, when he was just 18, and will carry your groceries to your car if the bag’s too heavy. Working the cash register is his good friend Al Strozier. Originally from Penn Hills, he sweet-talked Mr. Greenwald into hiring him in 1990, after he was laid off from a refinery job in Wilkinsburg. His son, Lorrenzo, followed in 2000, when he was 13. Mr. Kennedy, the butcher, has been here 16 years, long enough to remember the days of “swinging” meat. It now comes to the shop in sections. “We’re like family — everyone pulls together, ” he says. Some days there’s just a trickle of customers. But there’s still enough folks who prefer the old-time feel of the shop to modern grocery stores that it often gets very busy, says Mr. Kennedy. Early in the month, lines can stretch all the way out the front door, and not just with locals. Beatrice Jones, who’s been shopping at Bell’s for more than 20 years, makes the trek from Homestead at least once a week. Other Mon Valley communities also are well represented along with the city of Pittsburgh. He’s extremely fond of his boss, too, likening their relationship to that of a father and son. “We fight all day, but it’s just work,” he says. Mr. Greenwald has a soft spot for Mr. Andrews, too, as evidenced by a whimsical black-and-white mural he had painted on the side of the building two years ago to mark Mr. Andrew’s 18th year on the job. Braddock has seen its share of sorrow over the years, and far too many buildings have been torn down, notes Mr. Andrews. “But I know one that ain’t goin’ nowhere,” he says. He points to the mural bearing his name. This is Louis Greenwald’s favorite way to prepare a beef brisket. You can substitute any root vegetable for the carrots. Season raw brisket with salt and pepper. Place in a roasting pan. Add onions, barbecue and Worcestershire sauces and vegetables. Cover, and roast for 31/2 hours, or until fork-tender, basting every so often with pan juices. (If meat looks like it’s getting too dry, add a little water or stock.) 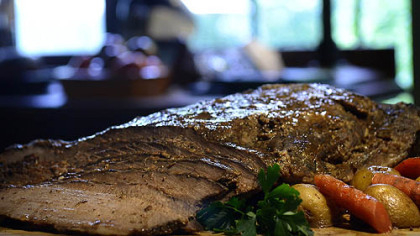 When fork-tender, remove brisket from pan, reserving vegetables and juices. Allow to cool, then place in refrigerator overnight. Place roasted brisket on a cutting board and slice thinly across the grain (the muscle lines) at a slight diagonal. Place meat with reserved vegetables and juices into a 325-degree oven, and heat until warm. Serve with a green salad or vegetable. Serves 16 to 20 people.